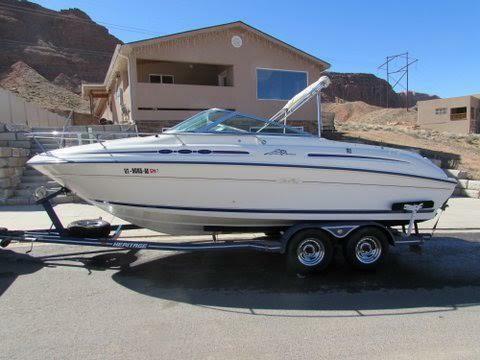 2006 Sea Ray 225 Weekender 2006 Sea Ray 225 Weekender Powered By a 2006 Mercury Mercruiser 5.0 MPI Engine With Only 128 Engine Hours. 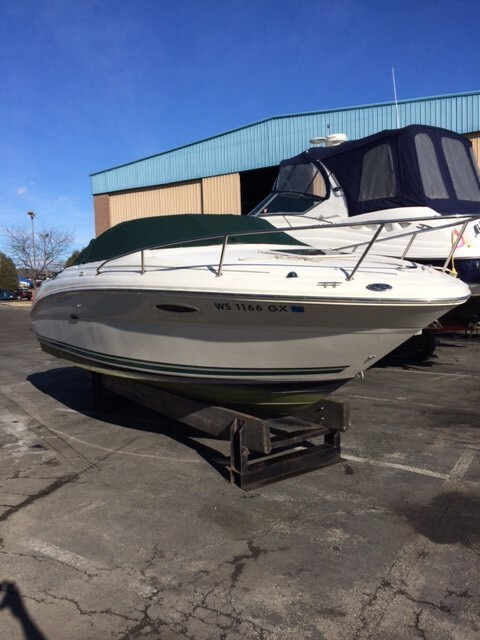 Twin Batteries With Select Switch, Bimini Top With Surround, Trim Tabs, Boarding ladder, High Bow Rail, Fresh Water Cockpit Shower, Porta Potti With Deck Pump-Out, Automatic Fire Extinguishing System, Cabin Sink & Table, Clarion AM/FM/CD Player. Boat Has Been Well Maintained. Why Wait? 2003 Sea Ray 225 Weekender Options/Equipment: Bravo III Outdrive, Stainless Steel DuoProp, Lowrance 3500 Depthmeter, Ritchie Compass, Extended Swim Platform w/ Fold-Down Swim Ladder, Transom Shower, Ski Eye, Anchor Light, Transom Door, Gunnel Storage, Cockpit Coaming Bolster Cushions, Bimini Top w/Mooring Cover, (2) Batteries w/ Switches, Removable Cockpit Table, Aft Motor Box Seating w/ Removable Port. & Stbd. Jump Seats, Helm Bench Seat w/ Cooler Box Facing Aft, Back-to-Back Passenger Seats that Convert to Sunpad, Step-Up Walk-Thru Windshield, Automatic Halon System, 12-Volt Outlet @ Helm, Clarion AM/FM CD Stereo w/ Helm Controls, Navigation/Anchor Lights, CO2 Detector, V-Berth Sleeps Two w/ Convertible Dinette & Storage, Cabin Sink & Cooler Box, Trash Receptacle, Sani-Pottie Porta-Pottie w/ Privacy Curtain, Cabin Lights, Sliding Companionway Door, Anchor Locker w/ Anchor Roller Trailer Does not go with Boat !! 2006 Sea Ray 225 Weekender 225 WEEKENDER The cockpit has enough room for six to seven people to sit comfortably. When you need even more room for gear or to cast a line out the aft cushions can be easily removed. The 225 even features a walk-through transom door that leads right to the integral swim platform. Once below, the cabin is spacious and has a galley to port that features a sink, faucet, and trash receptacle. The V-berth can be converted easily into a double berth for over-nighting. 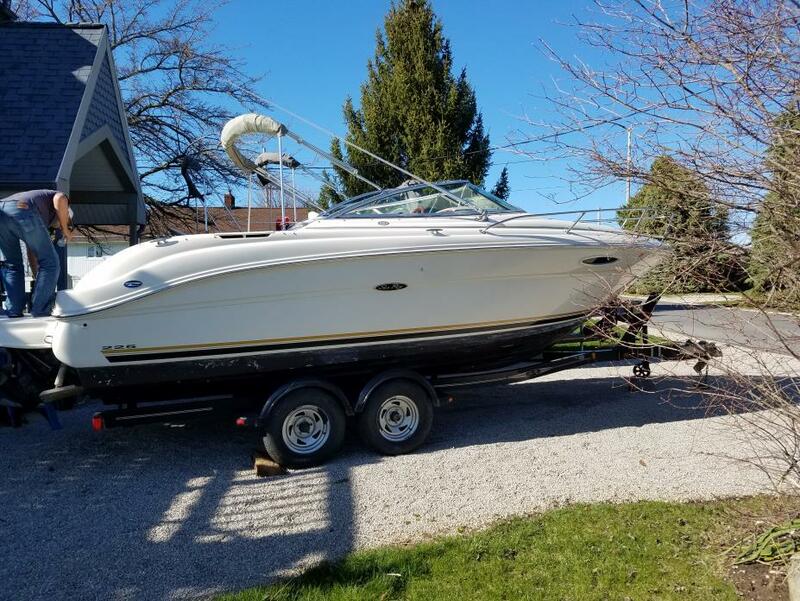 2004 Sea Ray 225 Weekender, This low use, one owner Sea Ray cuddy cabin has the comfort of a small cabin to sleep on and the performance of a well equipped boat. Trades Considered. 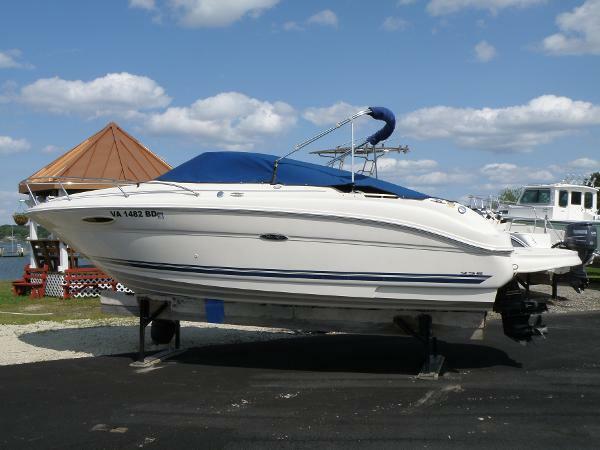 2003 Sea Ray 225 Weekender PRICE REDUCED $4500 ON 3/14 Among all of the Sea Ray models, the 225 Weekender is a very popular one. She has a great lay-out with comfortable seating and a great ride! "Moore Fun" has been serviced yearly and dry stored here at Dare Marina since the current owners have had ownership. She is powered by a Mercruiser 5.0 MPI Alpha 1 engine with only 196 hours. She is the nicest 225 listed, turn key and ready for a fun day on the water. 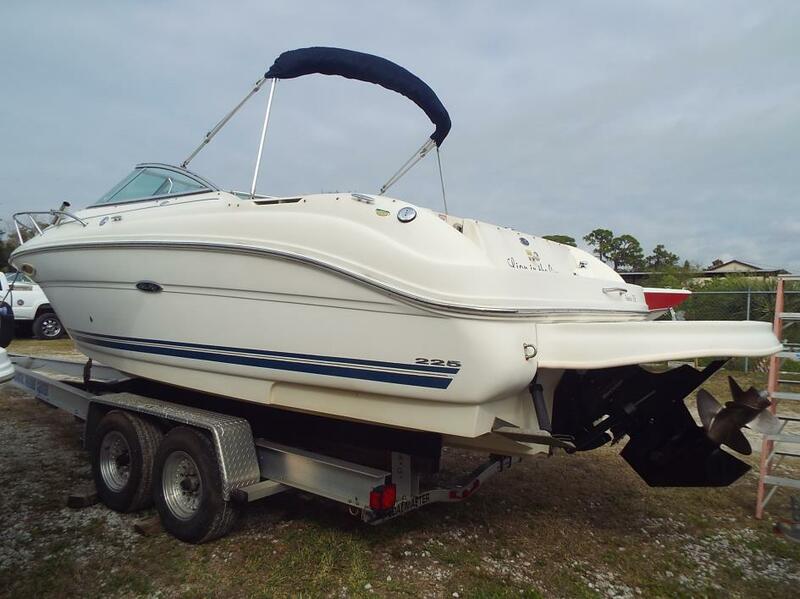 2005 Sea Ray 225 Weekender, Located in Nokomis, FL. Call Coastal Marine at 941-485-9500 or email: sales@cmcboats.com for more information. 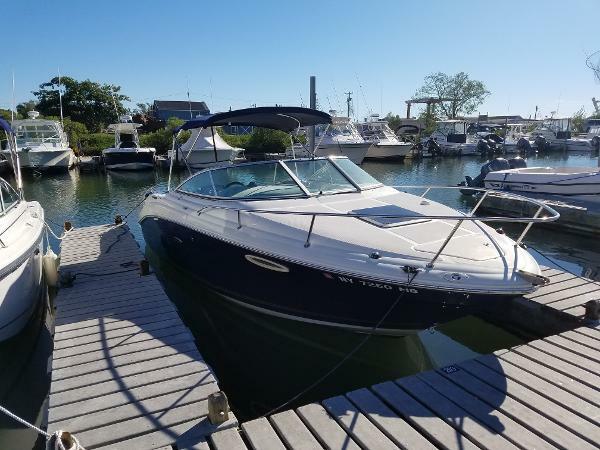 Unbelievably well kept 05 Sea Ray 225 Weekender with a 5.0 Mercruiser MPI motor and a Bravo 3 Outdrive with Stainless Steel Props that has exceptionally low hours of use. This vessel is a very rare find as it has been lift kept and meticulously maintained rendering it in "like new" condition. In being lift kept there is no trailer included with the boat, however, should one be needed a trailer can be purchased separately. 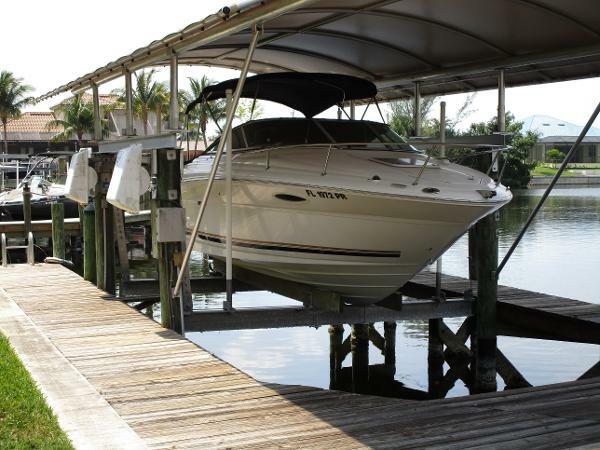 This boat has everything one would want to enjoy cruising fun on Florida's waters. 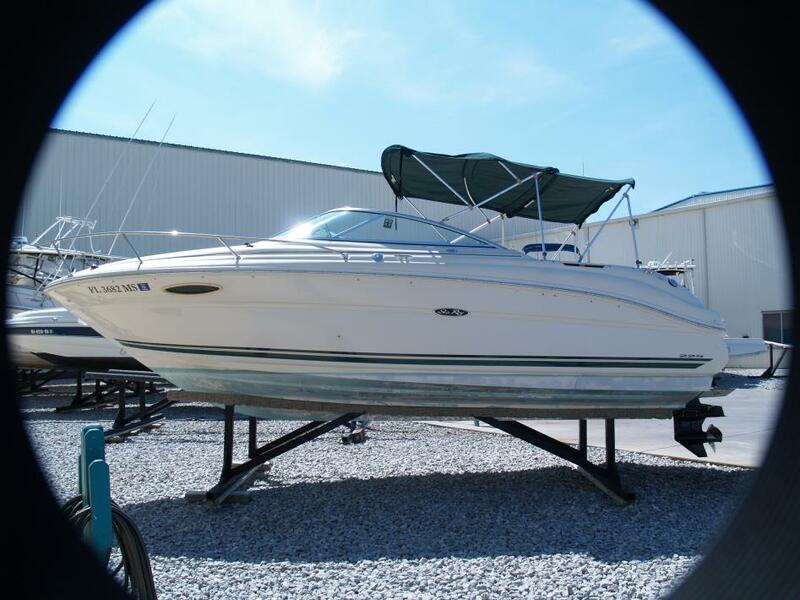 2002 Sea Ray 225 Weekender This 225 Weekender is a must see! 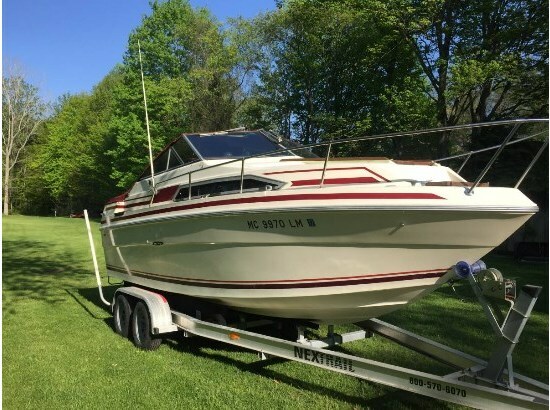 Re-powered last year with a new 357 Magnum MerCruiser, re-conditioned outdrive and reconditioned props, this versatile family sport boat is great for day trips and even overnighting. Easy boat to handle for families just getting into boating, her wide performance envelope will keep experienced boaters equally satisfied. Comfortable accommodations and all the standard features of the class add up to an ideal boat for your family's weekend adventures. This example is in excellent overall condition and the new engine, drive and props mean years of trouble-free enjoyment to come. 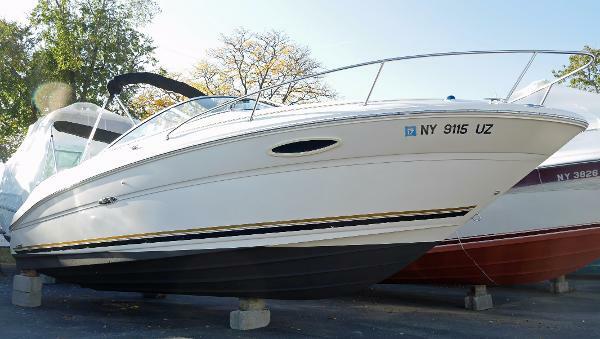 Visit BoatMax on City Island where you'll find this boat featured in our showroom. Now's the perfect time to start planning for your 2017 boating fun! 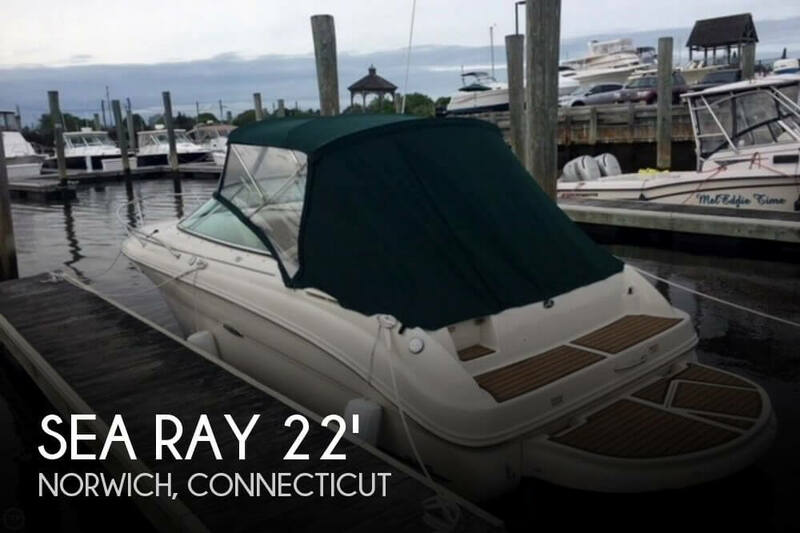 2007 Sea Ray 225 Weekender "Someday" - A beautiful 2007 Sea Ray 225 Weekender with only 80 hours on the engine! Cruise comfortably at 32mph powered by the 260hp Mercruiser 5.0L MPI Alpha I MCM. Accommodations include a V-Berth, carpeting, galley with a sink, and an enclosed head. A swim platform and ladder make this a great day boat. Includes a Clarion Stereo/CD player, as well as Sirius XM Satellite Radio. Electronics include a Lowrance GPS (includes depth finder and fish finder), as well as a West Marine VHF and a compass. A fire system is included in the engine compartment. 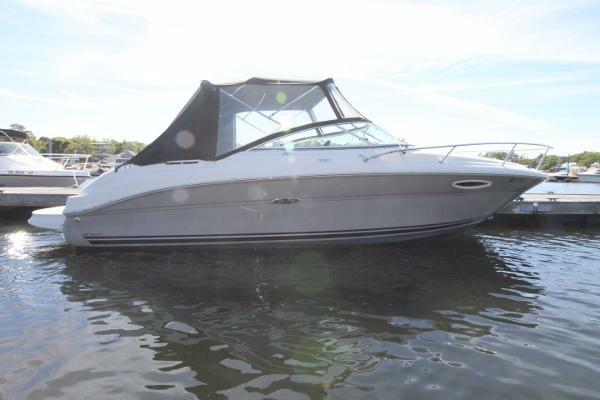 Very good condition - She is in the water and ready for its new owner! 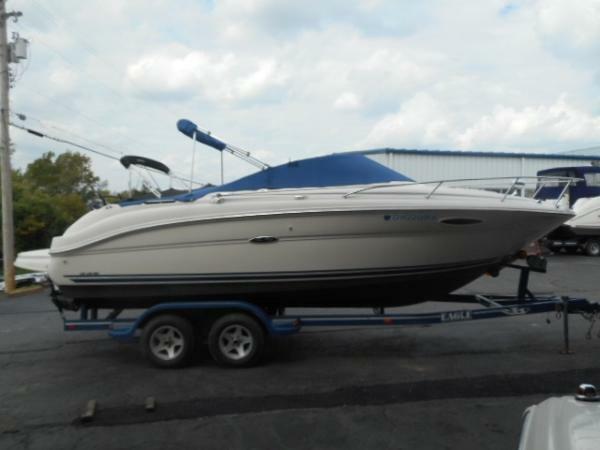 Also includes a Dual-Axle Sea Ray trailer!! 80 Hours !! 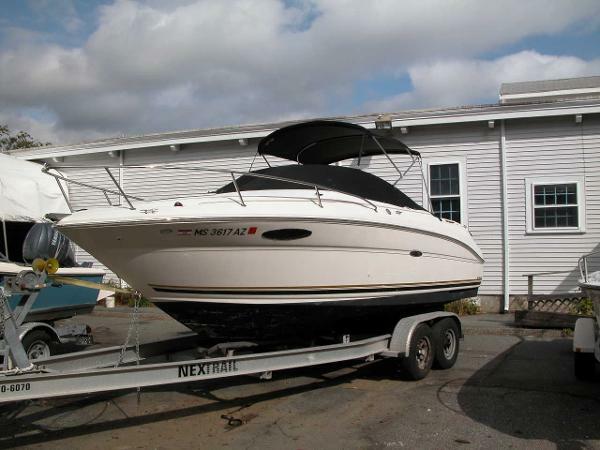 2002 Sea Ray 225 Weekender Super functional Sea Ray Weekender powered by Mercruiser 5.0L EFI. Includes camper canvas, cockpit cover, compass, depth finder, VHF, stereo with cd, sub, and transom speakers, spotlight, porta potti, clean cuddy cabin, Eagle tandem trailer and more. 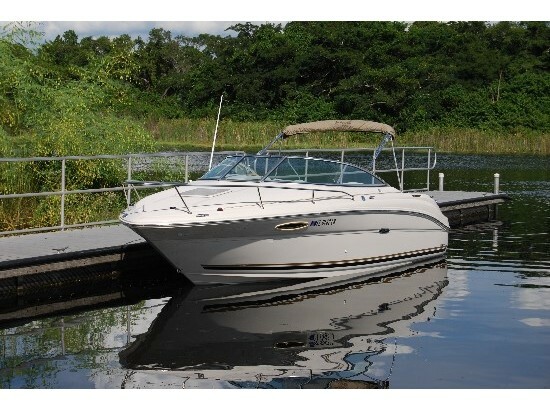 Perfect boat for day cruising or overnighting. Located in Cincinnati. All trades considered.